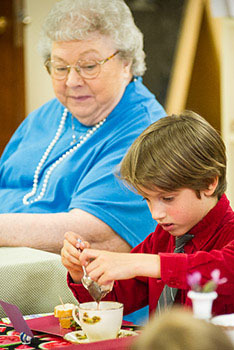 The Children's House level at Childpeace has five Children's House classes, four at the main campus and one that is nestled in an assisted living center for the elderly at The Terrace at 3060 SE Stark Street. This classroom has a morning schedule, curriculum, and approach that is identical to our main campus, with the added benefit of engagement with the elderly who live in the facility. In addition to the traditional Guide and Assistant, we have a Montessori trained Inter-generational Liaison who plans activities for the elderly with the children. The Liaison interviews the residents to see who is interested and able to opt-in to share in activities with the children. The Liaison schedules the elder visits to the classroom, and provides books, music and whatever support they need to engage with the children. The elderly interact with our children alongside our regular staff. A resident who is not intimidated by a large group of children may come to see us at the end of the morning work period once a week to read a book, play music while the children sing, make paper or do other crafts or participate in planting the garden beds at the turn of the seasons. There are several events throughout the school year to invite residents to join. Thanksgiving, winter holidays, Chinese New Year, May Day and Rose Festival are times when special events are hosted that draw together the children and the elderly. The children make a special birthday gift for participating residents and several times a year they go to the dining room to sing. Childpeace started this Children’s House in 1999, after participating in the building renovation plans to include an inter-generational component. We were hopeful that it would be a benefit to both the children and the elderly residents. We are satisfied that it has been a simple yet profound experience, and look forward to securing more grants for its continued health.